^ Bruce, Chris. Andrew Gilleland is new VP of Scion, Murtha moves to Toyota. Autoblog.com. September 24, 2015 [January 6, 2016]. ^ 2.0 2.1 2.2 2.3 Overview: The ScionStory. MSN Autos. 2009. ^ Edmunds.com Scion Overview. Edmunds.com. （原始内容存档于2009-03-01）. ^ 4.0 4.1 4.2 4.3 Bill Vlasic. Toyota turns edgy to grab Gen Y buyers. Detroit News. April 20, 2003. ^ New York Auto Show 2002 Highlights - Toyota Scion 互联网档案馆的存檔，存档日期2012-02-17. ^ Chicago Auto Show. www.chicagoautoshow.com. （原始内容存档于2008-05-16）. ^ Jonny Lieberman. New York 2010: 2011 Scion iQ is a little intriguing. Mar 31, 2010 [2014-10-27] （英语）. ^ Spotlight on Scion. BusinessWeek. [2009-09-28]. ^ Toyota's 'Scion' (Guerrilla) Brand in US. Marketing Strategies Case Studies. [2009-09-28]. （原始内容存档于2009-05-15）. ^ Miller, Kevin. Scion’s Pure Price Scheme Extends Beyond Vehicles. Autosavant.com. [2009-09-28]. ^ Consumer Guide 2008 Camry 互联网档案馆的存檔，存档日期2011-12-28. 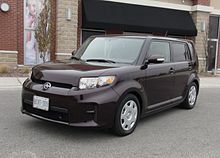 ^ Article: Younger buyers drive strong Scion sales. San Jose Mercury News. [2009-09-28].